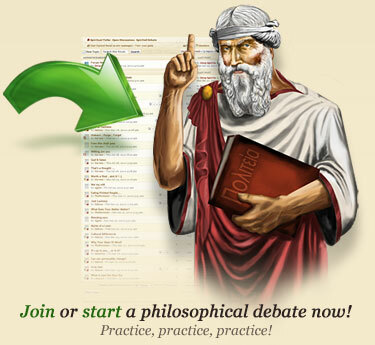 How about a Philosophical Debate? How do you feel about debates? What are discussions? Why bother? Better yet, let's rewind and start over. Philosophy relies on the rational argument and approaches some of life's most important questions systematically and methodically. Take 5 seconds to think about that. If you want to get to the bottom of things, what seems like the smartest, or shall we say, most reasonable way to get there? A sympathetic ear will only get you so far... to get the real answers, you need to probe. The best way to ensure a successful probing session is to love the probing itself! Enjoy the exploration of your mind... be curious of what all you may discover, about yourself, about others, about the question at hand, about life in general! Some people hear the word debate or discussion and they already start walking backwards. Why? They have been brought up to believe that their opinion is not worth voicing, and they haven't yet overcome that part of their upbringing. They come from a family or upbringing in which there was a lot of senseless and/or destructive arguing; they therefore associate any kind of disagreement with negative emotions and/or a painful outcome. They, either consciously or unconsciously, want to win and are not very successful whenever they do (or did) try to debate something. Since, for them, winning is the point, then losing always leads to frustration, hence the retreat into the "I don't like debates" statement. They, either consciously or unconsciously, want to win and cannot handle what they perceive as defeat very well, regardless of how often it happens, so even if it's not a common outcome. They have never had the opportunity to learn what it means to rationally debate a topic. We don't examine anything by merely looking at it from a distance. Nothing against a view from afar, but if you want to examine anything, you will eventually have to inspect it close up. You can do that by yourself, which will usually only get you so far, or with the help of others. A debate is a social form of examining view points, beliefs, and opinions. There are a few things that just don't go together with a rational, systematical debate. Of course you can still do these things, and delude yourself that you are a 'daring rebel' or a 'misunderstood thinker', but as soon as you do any of these things, you are the one who has officially stopped the debate itself and transformed it into something else. Here is a quick check list on what you just cannot do when debating. Don't be stubborn! With a philosophical debate the point is not to win, but rather to get to the core of the question and so get the ultimate answer. Don't be rude! There is simply no reason for that - ever. You never know what all the other person has been through. Be kind. Don't get personal! Always remember, you are debating the topic, the question at hand. Unless the person's character is the topic, leave them out of it. Don't assume anything! If you are not sure if you understood something correctly, always ask for clarification. Don't give up... If you have something to say, say it, and say it well. If you play by the rules, but your debate partner doesn't, then they left the debate. Don't feel bad. They are just not ready for you yet. If you feel like engaging in an intelligent philosophical debate, and are not yet a member of Deep Spirits, join us! Challenge yourself - Inspire others!